If you received or downloaded our welcome packet prior to your first visit to our office, please bring the completed forms with you to your appointment. Otherwise, please arrive a few minutes early to allow time to complete the medical/dental health questionnaire, the patient information form, and review and sign the financial information form. If you have a complicated health history, please mail it to our office so that we might review it in advance. Be sure to list all medications with dosages and any natural supplements, attaching an extra sheet of paper if necessary. Also, bring your insurance cards for us to copy. If your restorative dentist has given you a written referral or x-rays, please remember to bring them with you to your appointment. 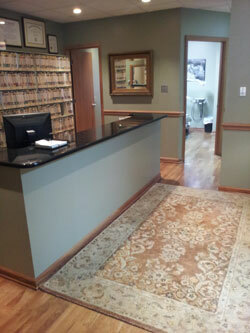 After a thorough exam, Dr. Angelo will discuss his findings and answer any questions you may have about treatment. His goal is to help you come to an informed decision regarding care. The office accepts many different insurance companies. We will review and explain your individual programs benefits and limitations. As a courtesy to our patients, we offer a complimentary preauthorization of treatment. The time of response varies with each insurance company. Please remember to bring your insurance card on your first visit.